Good news as Google and Microsoft will be adopting the “killswitch” on their smart phones just like Apple and Samsung. This move has come after a report has revealed that iPhone theft has fallen significantly since Apple added their new security features in to its mobile operating system. A “Killswitch” will give users the power to remotely disable their smartphones if its lost or stolen. It also helps increase security by adding more password layers. 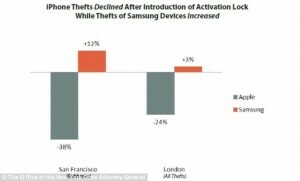 According to a report by the New York State Attorney General, iPhone thefts have fallen by 20% in London since the Activation lock was added to Apples iOS 7 last year. Samsung also added a reactivation lock to there OS in April to try and stop theft of their handsets. This entry was posted in News and tagged iPhone, Killswitch, Samsung, Windows. Bookmark the permalink.